We live during a time in history when man is ruining the earth faster than any solution can be implemented. From oil spills to overflowing garbage landfills, we need to take more responsibility as consumers. And it’s never too early or late to instill good habits and environmental awareness in our children. 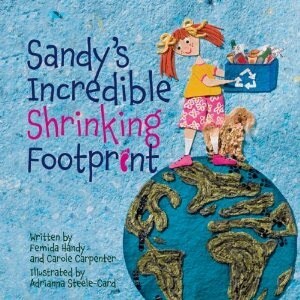 Sandy’s Incredible Shrinking Footprint is a simple story with a big message. We can each do our part—adults and children—to preserve the earth. My 9-year-old daughter and 6-year-old son enjoyed learning about how we can all shrink our ecological footprint, the mark we leave on the earth. At the end of the story, there’s a list of 12 things children can do. We discussed each one and why doing them would help take better care of our earth. Later in the week, I overheard my son tell his sister not to let the water run while she brushed her teeth. And it gave my daughter impetus to remind me of the benefits of having a garage sale, which I had been putting off! All this to say my children have become more aware of how their actions affect our earth. The illustrations were captivating because they were made from recycled and natural materials. We tried to figure out what materials were used and were pleasantly surprised to see pressed rose petal as one. Both my children thought the story ended too abruptly, though, and would have wished it to go on longer, with more action. The Garbage Lady was an interesting character, and perhaps a stronger plot development was needed. However, this book remains a great way to introduce young children to the topic of taking responsibility to care for our earth. Disclosure: Thanks to Annie from Second Story Press for sending me this book for review. I was not compensated in any other way, nor told how to rate or review this product. Sounds like your son really took the message to heart -- kudos to him!